Mould is nasty to deal with on your own, without the correct procedures the result can be cross contamination through other areas in the building and contents within the dwelling. Not to mention the short and long term Health effects on the buildings occupants. Speak To One Of Our Applied Microbial Remediation Technician Today! Fungi is the correct term for Moulds, Mildew, Yeast & Mushrooms. We often refer to it as Organic growth. Not all organic growth is bad, though there are many types that can be extremely detrimental to you and your families health. If left untreated can also have have serious consequences to the structure of your home or office. Mould spores can lay dormant for over 20 years, and become activated due to a water leak, poor ventilation, increased humidity and a number of of factors. Also dead spores can be as dangerous if not more than living spores. These spores may be allergenic, infectious & toxigenic. What Surfaces Can Mould Growth Occur? Wood, Cellulose Fibres, Plastics, Fiberglass, Cement & Concrete, Plaster Board, Flooring, HVAC Systems, Rubber, Metals, Paints, Fabrics, Plants/potting Soil, Wool/Hair/Skin, Humidifiers & Vinyl Wall Coverings. Often in a water damage/loss situation where plaster board, skirting and framing becomes wet, if left will result in some form of organic growth. It important to start the drying and remediation process within the first 24-48hrs to help control the potential for organic growth, dry rot and other adverse effects caused from such loss. Category 1: Clean water - generally from a source which does not pose substantial harm to humans. Category 2: Grey water - Is considered unsanitary. It contains some degree of contamination. Category 3: Black water - Always contains pathogenc agents, making it grossly unsanitary. What's The Process To Remove Mould & Remediate Effected Areas? We treat each project differently, Upon inspection a detailed plan and scope of works is developed. Develop a course of remediation action and scope of works, this could include recommendations to prevent re-occurrence of further organic growth and damage. 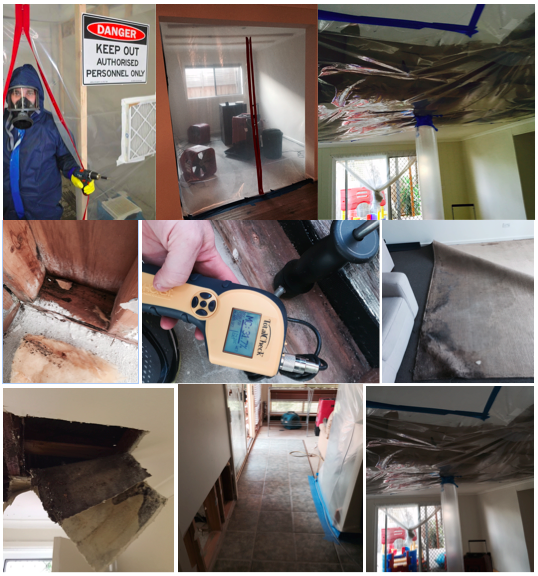 During the mould removal and remediation process our staff are careful to follow health and safety protocols and safe removal and disposal practices. Our technicians will also record and document each stage of the project and communicate the projects progress and further requirements. Asthma, Allergic Reactions, Joint & Muscle pains, Short Term Memory Loss, Fever, Skin diseases like rashies, Immunity Deficiencies, Chronic Bronchitis, Neurological& Nervous Disorders & Internal Bleeding to name a few.